Just Another Day...: Five Months! Happy 5 Months, baby E! After last night's late-night vent session about time and the lack of it these days, I'm trying desperately to get myself together today. This has included a much-needed albeit minor update to the blog design for fall, the inclusion of baby #3 in the header graphic (welcome, little E!) 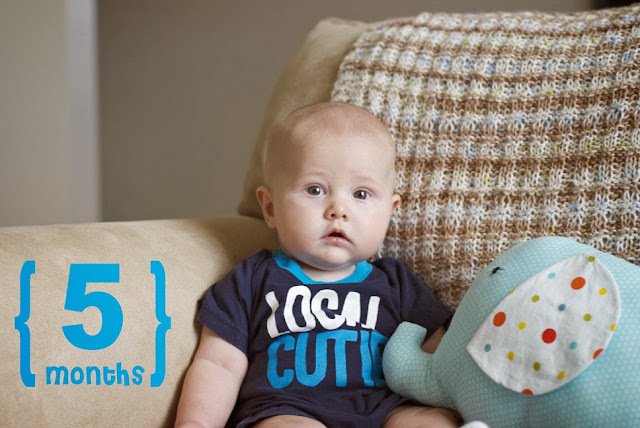 and a 2-weeks-late 5 month photo session with the little guy this morning. I'll admit this time and again: it is NOT an easy task for 1 person, 1 baby and 1 50mm lens to make magic happen. Hence the complete lack of a smile on the little guy's face. I tried to get Chase to help me make him smile, but that wasn't half as much fun as playing on the iPad, so I lost out there. If you know how to make a baby smile while simultaneously taking said baby's photo, I would LOVE to hear it! Just a little recap on where we are 5 (and a half) months into things with baby E. He's SUPER AWESOME in the baby sleeping/eating departments. All of our kiddos have done well with these areas at an early age and I promise we haven't taken it for granted! Sleeping a good 8-10 hours at night around 2 months, then stretching out to a good 10-12 hours by 4 months is nothing short of a blessing! Especially when you have bedtime and morning school routines for two older kiddos to contend with! And he's been a great eater, as evidenced by the massive 15 1/2 pounds of baby pictured above. We're starting to settle into a feeding schedule -- about 4 times per day -- and I couldn't be more ecstatic that he's a nursing champ and that my supply has kept up with him! My long-time readers can remember the significant milk supply issues I had with LO and Chase, so I consider it a HUGE blessing to be in such a great place with him (not to mention the amazing frozen stash in our recently-purchased chest freezer!). I admit I haven't been working terribly hard on getting him to roll over, sit up, etc. I know these are milestones he should be reaching around this age, and don't get me wrong -- he's close. He has rolled over two or three times (tummy to back), but I'm just not in a hurry to see this guy grow up. I guess that's pretty normal for the youngest/last baby (or so I'm told). For now I'm just enjoying those squishy cheeks and plenty of love and squeezes with my sweet baby. Life as a stay-at-home/part-time-working/full-time-PTA-volunteering mama is HARD WORK. Don't let anyone ever tell you otherwise! At times I wish I worked a full-time job because it would eliminate a LOT of the "stuff" on my plate as a SAHM, but I wouldn't trade these special years for anything! I'm learning firsthand how quickly time passes (did I mention that little guy above will be HALF A YEAR OLD in TWO WEEKS!?) and I'm feverishly considering my options to allow me to put a greater focus on my children and family during these special years that will be over in a fleeting moment. Too many distractions and not enough quality time. That's what life boils down to for me these days. And believe you me I won't stop 'til I figure out how to balance it all... even if my FAMILY is the only thing left standing in my new & improved day-to-day routine! Thanks for hanging in there and being patient with me and my lack of updates, friends!